Travel: Arran is the most accessible Scottish Island with direct public transport links. Direct train from Glasgow Central Station at 8.33am links with the boat. 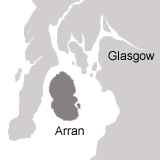 It takes 1 hour from Glasgow Central to Ardrossan harbour and a 55 minute ferry crossing to Brodick. The ferry leaves Ardrossan 9.45am check in closes 10mins before for passengers and 30 mins before for cars. Get there early in the summer or the boat might be full. Booking is essential if you are bringing a car! Another ferry runs in the summer from Claonaig to Lochranza at the North end of the Island. 25mins. Rail and Sail - You can buy a direct day return from Glasow central to Brodick harbour. Ferry Pickup: Pre-Booking essential, Phone the evening before your booking to check on the forecast and again in the morning between 8 and 9 am to check the latest weather forecast and confirm you are coming (01770820395 or 07717712727. We will pick you up at 10.45am with our blue paragliding minibus. We park opposite the main road from the Brodick ferry terminal in the carpark of the large red sandstone Douglas Hotel. Returning on the 4.40pm or 7.20pm ferry. (There are extra ferries in summer) We have limited space in the minibus so generally there is not room for people not taking part. Return transport to the ferry terminal - either by our minibus or by public tranport depending on which flying site we are at or if you are finishing earlier than the rest of the group. If you have your own car we may arrange to meet you at the flying site. Weather: Paragliding is a weather dependant sport, Scottish weather is vary changeable! We look at the all the forecasts (see our weather links page) and if it doesn't look suitable we postpone the training and your booking can be moved to another day. Sometime's the forecast is wrong and the morning looks OK but the weather turns out to be unflyable. Safety is our priority and we may then need to cancel the day. If this turns out to be the case then we don't charge you for the days training but we are not responsible for any travelling costs you may have incurred. Public Transport: Trains run direct from Glasgow central to Ardrossan harbour. There are buses from Brodick harbour to all the villages. Glasgow Airport: take a bus or taxi to Paisley Gilmour street train station and catch the boat train to Ardrossan harbour. Or arrange hire car. Prestwick Airport: Take a train to Kilwinning and change for Ardrossan harbour. From England just head towards Carlisle and then follow signs for Kilmarnock and Ayr once you have crossed the Scottish Border. The scenic Galloway Tourist Toute along the A713 is a beautiful alternative to the main roads. From the north, just head south towards Glasgow and pick up the M77/A77. There are also express coach links from all major cities, via Glasgow and a good network of local bus services within Ayrshire and on the Isle of Arran. www.arranselfcateringholidays.co.uk Pirnmill - best with own transport. www.arrancamping.co.uk - Brodick in Glen Rosa - Beautiful but no showers and a bit of a walk if you don't have a car.